Hana Nazir, a senior at Johns Creek High School, was selected as a finalist for the Georgia Poet Laureate’s Prize, from over 200 submissions from high school students. 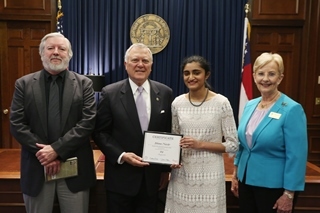 On May 13th, 2015, she met Governor Deal, the First Lady, and Judson Mitcham, the Poet Laureate of Georgia (far left in photo below), at the State Capitol. Hana was then given a tour of the Margaret Mitchell House. beaten to a pulp, to perfection. Read her full poem below. Hana enjoys learning new languages, creative writing, and photography, and is a self-proclaimed science nerd. She is known for her spontaneous humor, random outbursts of trivia, and profound penchant for coffee. She will be attending Dartmouth College in the fall. All is well on this tranquil afternoon. blotting the soft cotton like fresh ink. All is well on this tranquil afternoon — so it seems.